Iconic, powerful, timeless, the sound that launched rock, country, bluegrass, and folk. Classic herringbone, East Indian rosewood, ebony and Sitka spruce in the shape that started it all: the Dreadnought. Paired with our most comfortable neck, vintage appointments, scalloped, forward-shifted bracing, and a lifetime warranty. 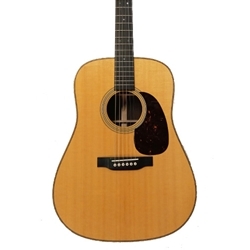 Powerful bottom end, rich tone, and strums that will fill the room, music history made new. Also available in Sunburst and Ambertone finish.